Paid for by Rackauckas for District Attorney 2014. ID# 970780. Here’s the comprehensive run-down on all non-federal and non-judicial races on Orange County’s ballots for the 2014 primary election. With regard to State races, I’m only posting Board of Equalization and legislative because statewide races require that I check 58 Registrars, which is a task too onerous for this blogger; going through five Registrars for BOE was annoying enough. 36th Senate District: Supervisor Pat Bates (R) is unopposed. Ken Lopez Maddox (R) pulled signatures-in-lieu but did not file those papers nor pull any others. No one pulled papers, let alone filed papers, in San Diego County. Sheriff-Coroner: Sandra Hutchens (R) is unopposed for re-election. Superintendent of Schools: Appointed Incumbent Al Mijares (R) is unopposed in his bid for his first elected term. Treasurer-Tax Collector: Shari Friedenrich (R) is unopposed for re-election. Board of Equalization: Assemblywoman Diane Harkey (R), former Assemblyman Van Tran (R), Accountant/Realtor Lewis Da Silva (R), Store Owner/Businessman John F. Kelley (R), and Government Auditor Nader Shahatitt (D) are all running. Assessor: Incumbent Webster Guillory (NPP) pulled papers and filed them on the last day. His opponents are Consultant/Appraiser/Businessman Jorge O. Lopez (D) and former Board of Equalization Member Claude Parrish (R). Clerk-Recorder: Incumbent Hugh Nguyen (R) faces a trio of opponents: former Orange Unified School District Trustee Steve Rocco (NPP), Capistrano Unified School District Trustee Gary Pritchard (D), and Businesswoman Monica Maddox (R), who is married to former Assemblyman/former Capistrano Unified School District Trustee/former Garden Grove Councilman Ken Maddox (R). See this post from OC Political on the bizarre story of Los Alamitos Councilman Troy Edgar’s (R) failure to qualify that required the Registrar of Voters to examine surveillance camera footage. 69th Assembly District: As expected, Assemblyman Tom Daly (D) is being challenged by Santa Ana Unified School District Trustee Cecilia “Ceci” Iglesias (R). Inexplicably, Sherry Walker (R) who only registered to vote in AD-69 recently, filed to run. 5th Supervisorial District: As expected, Orange County Businessman/Councilmember Robert Ming (R), Councilmember/Businessman/Engineer Frank Ury (R), and Mayor/Businesswoman Lisa Bartlett all filed. Unexpectedly, Deputy District Attorney Joe Williams (R) filed. 34th Senate District: Supervisor Janet Nguyen (R), RSCCD Trustee Jose Solorio (D), and former OCBE Trustee Long Pham (R) are running. 55th Assembly District: Councilwoman/Educator/Executive Ling-Ling Chang (R), Small Business Onwer Phillip Chen (R), Councilmember Steve Tye (R), and Social Worker Gregg D. Fritchle (D) filed. 65th Assembly District: Assemblywoman Sharon Quirk-Silva (D) and Small Businesswoman Young Kim (R) are the sole candidates. 68th Assembly District: Assemblyman Don Wagner (R)is being challenged by Psycotherapist Anne Cameron (D). 72nd Assembly District: Assemblyman Travis Allen (R) is being challenged by Retired Police Commander Albert Ayala (D) and Joel Block (D). 4th Supervisorial District: Supervisor Shawn Nelson (R) is being challenged by Small Business Owner Rudy Gaona (D). Gaona has made two unsuccessful bids for Anaheim City Council, and in both instances came in close to finishing last. 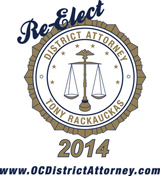 District Attorney-Public Administrator: DA Tony Rackauckas (R) is being challenged by Attorney Greg Diamond (D). County Board of Education, Trustee Area 2: Incumbent David Boyd (NPP) is being challenged by Orange County Small Businessman Tom Pollitt (R). County Board of Education, Trustee Area 5: Incumbent Elizabeth Parker (R) is being challenged by Orange County Businesswoman/Mayor Linda Lindholm (R). Irvine Unified School District Special Election: Ira Glasky (R) seeks a return to his former seat on the Irvine School Board. He is being challenged by Bob Vu (R) and Carolyn Inmon (D). I will be back to update the Congressional races. There’s something screwy in the log from one of the other counties on one of the multi-county Congressional races that include parts of Orange County; I’d like to confirm if it’s a clerical error, I’m misreading something, or it’s something more serious. I will post later on the Congressional races. I want to thank our readers for what was a very successful event yesterday on the blog. The debate set a record for most readers in a single day for one post. We will continue to do this monthly and are open to topic suggestions from our readers. Feel free to e-mail info@custom-campaigns.com with your suggestions. Now that we have seen Hugh Nguyen get appointed as OC Clerk-Recorder and Jan Grimes appointed as Orange County Auditor-Controller, we now move on to the process of Orange County Public Administrator. I already know who three of the applicants are based on them announcing on Facebook or during the Orange County Clerk-Recorder procedure. Unfortunately, I do not have a lot of information on this process at this point but stay tuned as I fill in the blanks as soon as information becomes available.